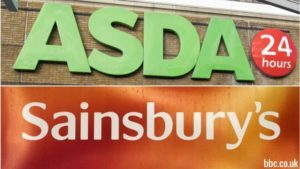 Sainsbury’s and Tesco are respectively the number two and three UK supermarket operators by turnover. As anyone remotely familiar with the UK grocery scene will attest to, the daily battle for the consumers’ grocery spend is more intense and savage in Great Britain than just about anywhere else. The UK market is still relatively segmented with Waitrose sitting at the top of the pile, attending to the needs of the well-to-dos, whilst German imports Aldi and Lidl are slugging it out at the discount end of the equation, intentionally or otherwise complicating life for the operators trying to cover the middle ground. The UK supermarket chains come under intense scrutiny in the British media with every commentator being an expert, right? To appreciate what is going in the UK market requires more than just a superficial understanding of this week’s High Street shopping habit. The causes behind the proposed Sainsbury’s/Asda merger sit a lot deeper. Their origin can be found in the fundamental societal changes mankind is currently undergoing. The traditional supermarket model is under attack from all sides. Specialist butchers and greengrocers are experiencing a renaissance rather than being faced with extinction as supermarket operators had confidently predicted twenty years ago. Internet shopping means the bricks and mortar stores are seeing reduced foot traffic, less impulse purchases and less money through the tills. Store operating cost per dollar/pound/euro/yen income is therefore increasing at a rapid rate. The next part of the mix are new entrants like Amazon Fresh who are not encumbered with a costly and cumbersome store network in need of upkeep and maintenance. Unless of course they buy one to understand that side of the business better and treat it as a real time laboratory. Then there is the environmental lobby who want to ban anything plastic from supermarkets yesterday, which is entirely plausible when one looks at the plastic waste volumes bobbing around in the South Pacific but severely challenges our current FMCG marketing and logistics concepts. And if that wasn’t enough, the migrations waves experienced by many of the developed nations bring with it the rise of the ethnic entrepreneur who sooner or later hits on the idea that his fellow immigrants would really appreciate an ethnicity based supermarket where they can find the foods they know from their home country without having to fight their way past canned baked beans and spaghetti, kippers and tomato sauce. Finally, there is the suspicion that the the degrees of sophistication of some of our produce supply chains are getting in the way of common sense, to the detriment of producer and consumer alike. Anyone who wants that statement explained in a bit more detail can get in touch via the Agribusiness Academy page.